The E-Newsletter is an electronic publication sent once a month via email. It contains legislative and member news. To subscribe, email: afsacomm@hqafsa.org. Each issue of the E-Newsletter can be found here. 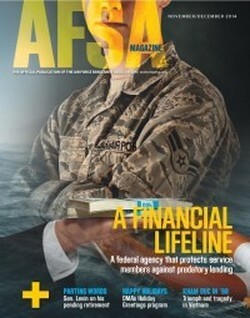 AFSA Magazine is a bi-monthly publication available by subscription, for $20 per year. The magazine is sent electronically to all members, and as an in-home publication to subscribers. To receive the magazine in your home, or electronically, contact HQ AFSA at 301-899-3500. The E-Newsletter is an electronic publication sent weekly via email. It contains legislative and member news. To subscribe, email: afsacomm@hqafsa.org. The Headline Roundup is a compilation of headlines regarding legislative issues of interest to members. This is also sent out electronically, usually once or twice a week. To be added to the distribution, email afsacomm@hqafsa.org. Each issue of the Headline Roundup can be found here. For inquiries about previous editions, email afsacomm@hqafsa.org. The Washington Report will update members on AFSA's activity with legislators, senior Air Force leaders, the Department of Veterans Affairs, and other government leaders. Expect it to come weekly when Congress is in session, less frequently when it is not. Each issue of the Washington Report can be found here.